Okay, so when I first saw the Lulu Guinness umbrella this made me think that it is definitely not my style – it screams so much femininity! Well, this would definitely turn heads and make people stare at you – in a good way. This would bring so much fashion into the streets every time they see you walking with this. 1. Convenience – this is an umbrella that does not do much fiddling about; it is your straight as it is type of brolly. With just one push of the button then definitely you have that bright red canopy covering you. It is doubly covered – atop it is a bright red canopy, just make sure that you don’t leave it near a phone box otherwise you might forget that you have it there. Underneath is a diagonal black and white color which resembles a zebra but if you are a girly girl, I bet you wouldn’t mind at all, right? 2. Double cover – it doesn’t do much when it comes to durability and strength, neither has it said about what speed of the wind can it hold tension with, the double cover is simply more for the elegance of it. 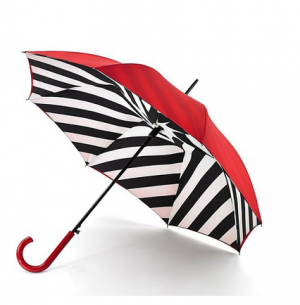 Lulu Guinness umbrella is definitely your classy umbrella. 3. Polyester – the material used in Lulu Guinness umbrella is polyester, this is one of the best materials to use as this is either water resistant or waterproof. Of course, you are buying an umbrella because you would like protection against the rain. 4. Size – unlike a folding umbrella, this resembles like a walking stick as it measures 84 cm long and has an arch handle which makes it comfortable to hold or hang on to. When the canopy opens, the Lulu Guinness umbrella measures up to 94 cm – gives you an adequate amount of coverage against a heavy downpour. 5. Limited edition – well, if you are a collector this should definitely go into your list. I should be saying this because I am a male, but I will give a more objective opinion about the Lulu Guinness umbrella. Personally, like what I have mentioned earlier, the umbrella is made especially for the ladies. As a man, I don’t think I would be caught using this. This is probably more of something that I can give as a gift for my mother, wife or girlfriend. The design is pretty interesting and eye-catching, but it is not really for me. When it comes to efficiency, under the circumstance that it is caught by a strong wind, its technology does not have the capacity or capability to go against extreme weather conditions. The Lulu Guinness umbrella, on a brighter side is the umbrella for anyone who is fashionably conscious but not for the adventurous type. Ergo, this may not have the best features compared to the most updated and innovative of them brollies but this is definitely something that could turn heads.